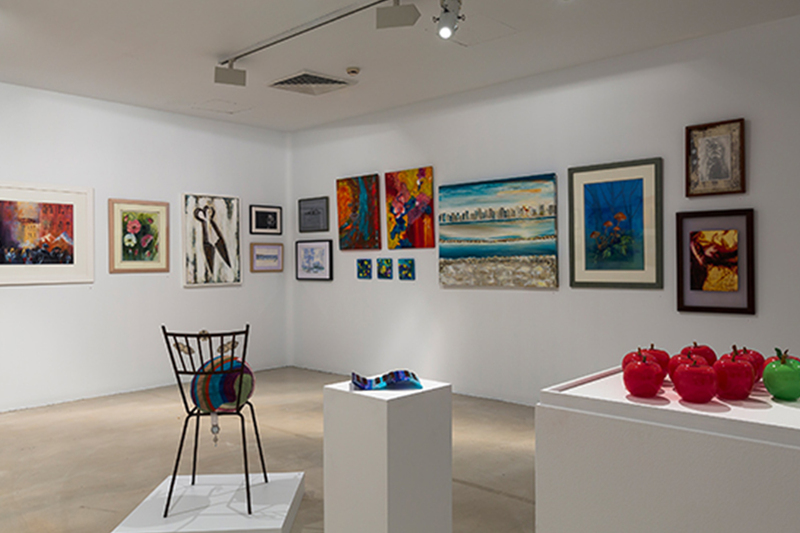 Campbelltown Arts Centre presents the Friends Annual and Focus exhibitions, an eclectic display of artworks by the Friends of Campbelltown Arts Centre. The Friends Annual exhibition is a chance to see some of the best art the region has to offer, boasting a range of styles and mediums throughout. The Focus exhibition highlights the work of a talented artist or collective from the Macarthur region, providing insight into their practice. The 2019 Focus artist is Machiko Motoi. Throughout the course of the Friends and Focus exhibition, local artist Machiko Motoi will travel frequently from her home studio in Campbelltown to the McIver’s Ladies Baths – a heritage-listed women’s baths at Grant Reserve in Coogee. Situated in the gallery, Motoi’s large-scale wall painting represents an Instagram account @getout_19. Audiences are encouraged to follow the account in order to witness the artist’s recurrent pilgrimage.Utilising the popular social media app, Motoi acknowledges how technology has integrated into the ways in which we publicly perform our private, everyday lives to the world. Motoi’s frequent journey across Sydney came from the artist’s interest in making real connections with people in an age of growing technological advancement that is seemingly unavoidable. The phrase, “getout_19” painted large scale on the gallery walls suggests that people should get out and experience the world. However, the phrase also makes reference to the response Motoi often experiences from others upon mentioning she lives in South West Sydney. Living on the edge of Sydney, Motoi draws our attention to the routine movement of people travelling across this vast region. She is also interested in their individual stories which, embedded in our language and culture, extend to the online sphere. These daily performances shape our sense of place and our understanding of traditions and spirituality. For Motoi, the act of ‘getting out’ helps her come to terms with her artistic practice and her Japanese heritage whilst living and working in Campbelltown, Australia. You can follow this performative work on Instagram by searching @getout_19 on Instagram.